Unless the power goes out, we don’t think much about the electricity coursing through the wires in its walls and ceilings. But your electrical system could be harboring problems that threaten both your property and your life. 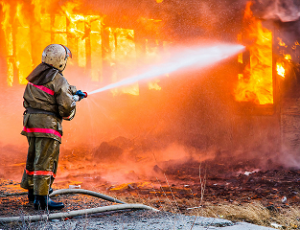 U.S. fire departments annually responded to 45, 210 home structure fires involving electrical failure or malfunction between 2010 and 2014, according the National Fire Protection Association (NFPA). These fires resulted in 420 deaths, 1,370 injuries, and $1.4 billion in direct property damage each year. Old appliances: Appliances that don’t meet modern safety standards or that have frayed cords or damaged plugs are one of the biggest causes of home electrical fires. Older appliances draw more power than today’s outlets are built to handle, and damaged cords channel heat onto carpets, curtains, floors, and other combustible surfaces. Faulty outlets and switches: Appliance that get intermittent power – such as lights flickering on and off – or that cause sparks when you plug them in can signal a problem with the outlet. The wiring in outlets and switches can loosen over time and pose a fire threat. Both should be checked yearly for looseness, breaks, and corrosion. Light fixtures: Lamps and other lighting can pose a danger when the bulb’s wattage exceeds the fixture’s suggested limit. Lamps with cloth or paper shades or decorated with other combustible materials can start fires when that material heats up. Antique lamps and other older fixtures may have damaged wiring that make them susceptible to overheating. Extension cords: While generally safe when used correctly, extension cords become dangerous when too many appliances are plugged into a single cord. This can overburden the outlet if it’s not designed to handle that load. Even when you plug in a single appliance, extension cords should always be used temporarily, never as a permanent solution. Space heaters: Portable space heaters, particularly the type with heating coils, cause fires when they’re placed too close to curtains, clothes, bedding, rugs, and cloth covered furniture. The heat from the coils can easily ignites the adjacent flammable material. Defective wiring: The average home today uses more electrical appliances than ever before: Refrigerators, air conditioners, washers and dryers are now sharing your electrical system with computers, video game consoles, TV streaming boxes, and other consumer electronics. If your home is more than 20 years old, the wiring may not be able to handle the added load and could overheat and ignite a fire. Electrical fire threats don’t announce themselves; you have to look for them. You can start by checking your home appliances and wiring for damage and other risk factors. In addition to replacing old or damaged appliances, we recommend consulting with a licensed electrician to make any necessary repairs or upgrades to your electrical system. Learn more about electrical safety and how you can prevent home electrical fires. Switchgear can play vital role in prevention of fire . The circuit breakers ACB MCCB MCB ELCB can prevent the fires caused by short circuits . Always, what has been a great concern is wire terminations on devices; switches, receptacles, circuit breakers. A couple of items to recognize – wire insulation stripped back far enough so only the conductor is under the terminal screw. With that being said, terminal screw, use this as the point to terminate wires in. Don’t use the ‘easy push ‘ in type receps, light switches . Too often I’ve seen where the conductor works itself out and creates arcing and slowly burns the back of the device, and that could lead to exactly what this article is about. One last item, when making terminations on a device, create a ‘U’ shaped pattern on the conductor , and bring the conductor on the left hand side of the screw terminal, then tighten down, pull and tug on the wire and re-tighten. Hope this helps.